Yesterday evening, a wonderful group of founders and entrepreneurs in the EdTech and Education Startups space got together over dinner to share ideas, insights and challenges they might face. While dining on the Green’s signature roast lamb and pumpkin & goats cheese pie, guests discussed the latest EdTech innovations and exchanged contacts. We were joined by great minds at Memrise, MyCognition, Contentd, Lexicum, TechHub, 3Fifteen, Phrasewise, Drum Roll HQ, Big Four, ShowHows, LBI and more. 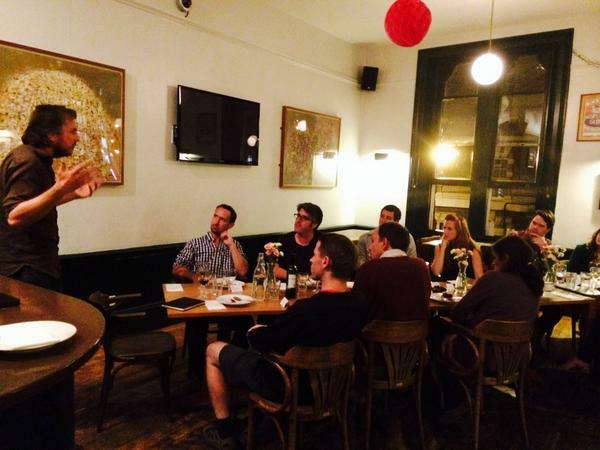 We were happy to welcome Ben Whately, COO at Memrise, to speak after dinner and his talk went down a treat. Thanks Ben for sharing your fascinating story. Memrise is an online learning tool with courses created by its community using images and science to make learning easy and fun, mostly for learning languages. Ben’s journey into the world of learning languages began when he moved to a remote corner of China to teach himself Chinese. We’re impressed. We’re looking forward to the next EdTech dinner, but in the meantime have a look at our upcoming tables. Thanks to our partner Taylor Wessing for supporting this dinner.